Outlook 2010 provides the native capability to convert a selected email message to a text file, an Outlook Template, Outlook Message Format (.msg file), or a Unicode Outlook Message. Here's how to do it. First, find the message you want to convert in the Outlook 2010 mail list, and click on it. This will open the "Save As" Window. Change the file name if you wish, then select one of the shown formats. When you're done click "Save" and Outlook will copy your message to the target format. Here's another way to copy to Outlook email to .msg files. If you are interested in copying your email message to an individual Outlook email file (called a .msg file), another way to accomplish this is to simply drag and drop the message from your Outlook list to your Windows desktop. This .msg file will be named <email subject>.msg. You can then attach the message to an email message or copy it to a flash drive for sharing. The .msg file will contain all of the images, header information, and file attachments that were in the original email. How can you copy Outlook emails to other formats? MessageExport is an add-in for Outlook that expands its ability to manipulate and convert email messages to different formats including .eml, pdf, csv (Excel), msg, gif, tif, mbox, and others. 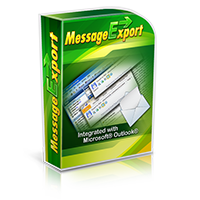 You can download a free trial of MessageExport and use it free for 15 days.